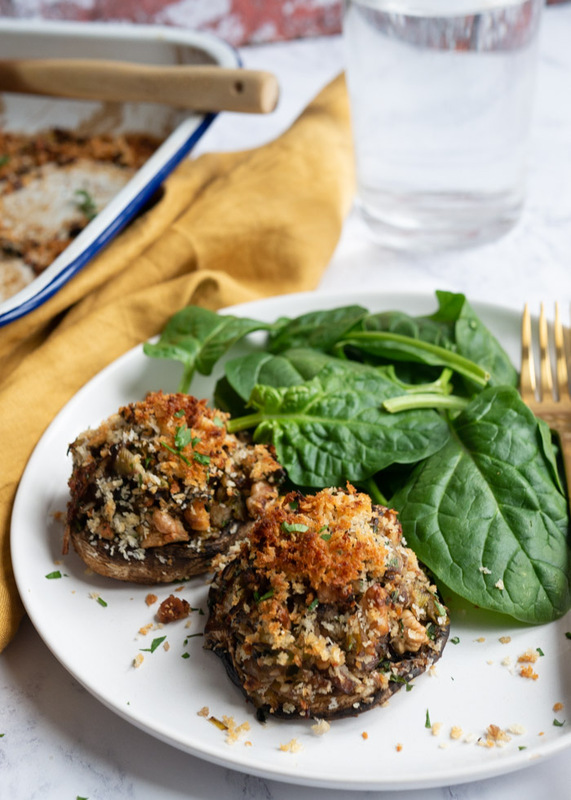 If you’re looking for an easy weeknight dinner recipe these vegetarian stuffed mushroom caps might just be the answer. 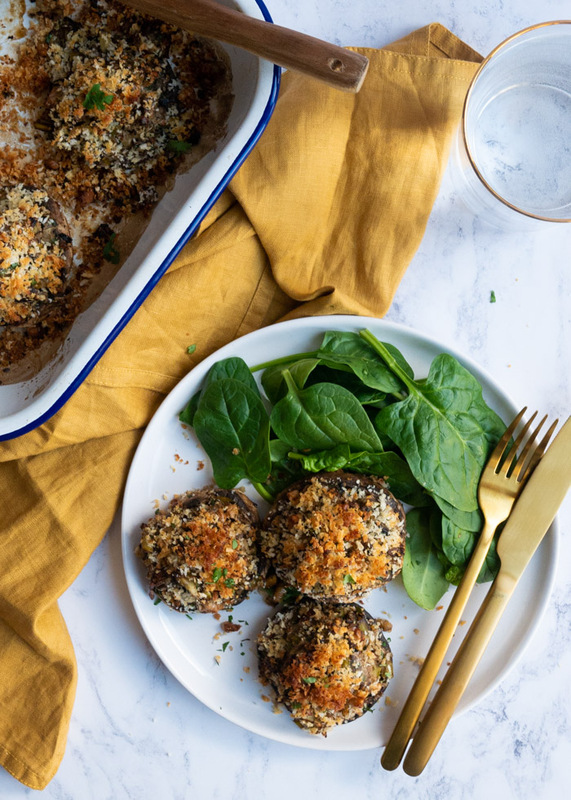 Filled with a mixture of leeks, mushroom, walnuts, breadcrumbs and parmesan, they’re full of flavour and easy to make, you’ll be whipping up this vegetarian dinner recipe in no time. Mushrooms, you either love them or you hate them, right? I am a lover (❤❤❤) and in my quest to reduce meat intake and up veggie intake, mushrooms have become a staple (see: Mushroom & Lentil Spaghetti Bolognese, for example). They have a fab meaty texture to them and a savoury flavour that no other vegetable can provide. And texture and flavour are important in a meal. Who’d have thought ey?????? The stuffing for these mushrooms is just the best. I may or may have not (but definitely did) eaten in by the spoonful, straight out of the pan. 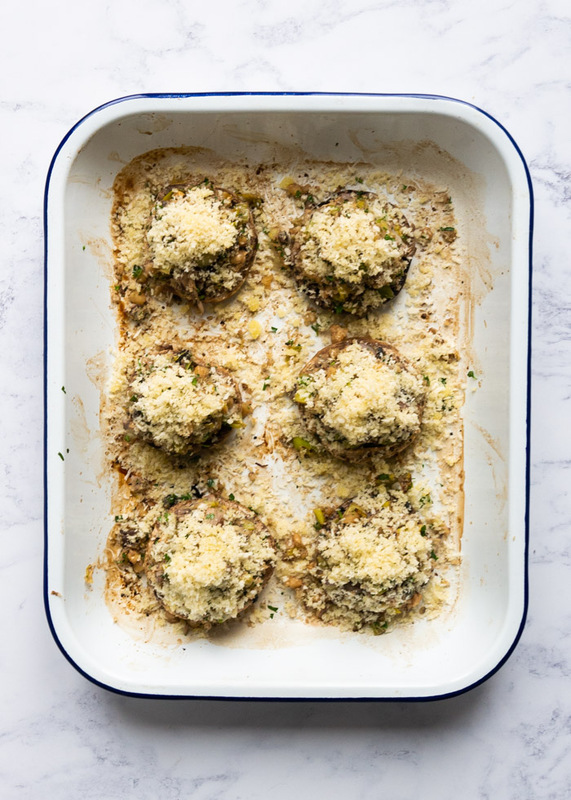 Leeks, mushrooms, walnuts, parsley, mustard powder, a little lemon juice, parmesan and breadcrumbs – nothing fancy but SO MUCH FLAVOUR. If you’re against mushrooms it would go wonderfully stuffed into chicken or with white fish. Cauliflower would also be a great companion. Lay your mushrooms in a roasting pan, gill side down. Brush with oil and sprinkle on salt and pepper. 2. 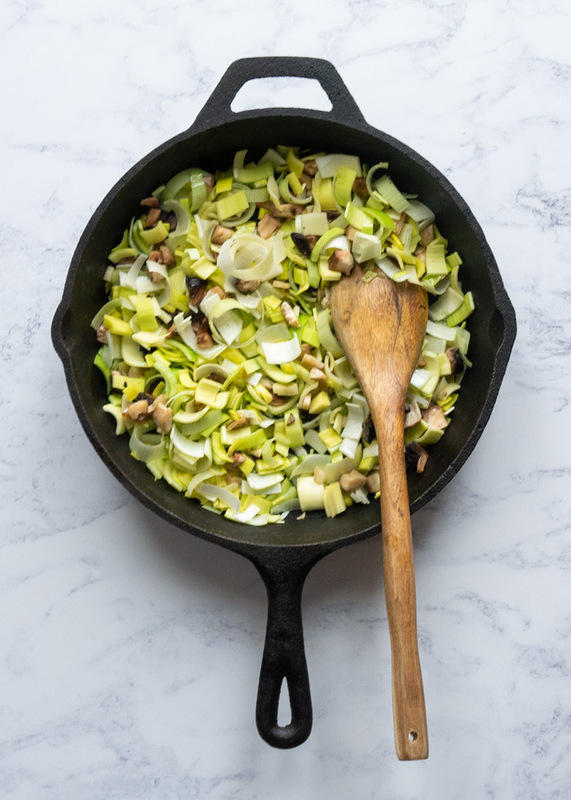 Saute the leeks and mushroom. 3. 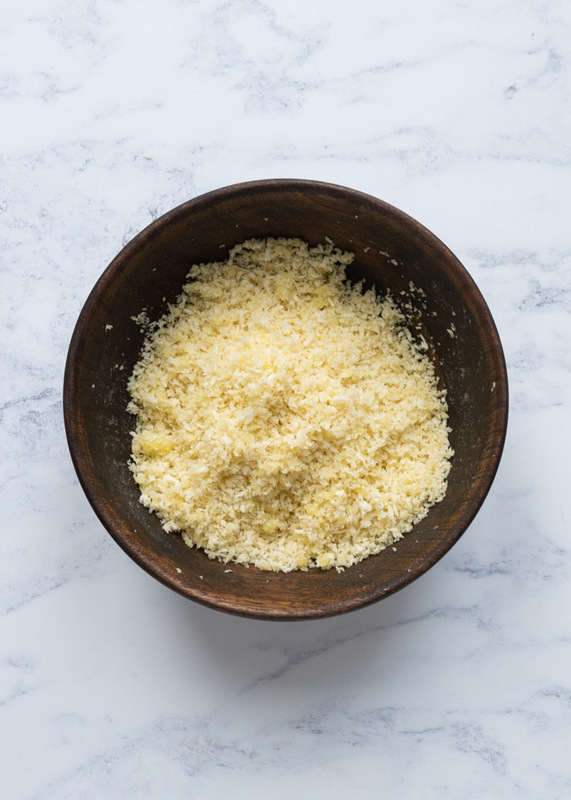 Mix the panko breadcrumbs, Parmesan cheese and olive oil together until everything is coated in oil. 4. Add the chopped walnuts to the frying pan. 5. Remove the frying pan from the heat and stir in mustard powder, parsley, salt, pepper and two thirds of the breadcrumb mixture. 6. Remove the mushrooms from the oven and flip them over. Divide the stuffing mixture equally between the mushrooms and spoon on top. 7. Sprinkle the remaining breadcrumb mixture over the top of the mushrooms. 8. Bake for 15 minutes until the breadcrumbs are golden and crunchy. 🥔 Potatoes, all the potatoes! 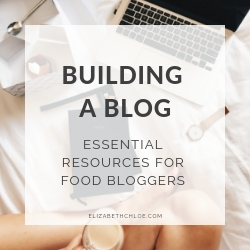 You can do mashed potatoes, baked potatoes, roast potatoes or maybe fries? I particularly love boiled new potatoes mixed with melted butter and chopped parsley. 🌾 Alongside your favourite grains. Something nutty like brown rice or pearl barley works particularly well. 🥦 Steamed greens, such as broccoli, green beans or asparagus. 🥗 Salad – some peppery rocket is delicious with these mushrooms. 🍲 If you’re feeling really fancy, a simple, creamy risotto would be DIVINE. Add any leftover stuffed mushrooms to a air-tight tupperware container and store in the fridge for 3-4 days. My preferred method to reheat these stuffed mushroom caps is to use the oven. Pre-heat your oven to 180 degrees Celsius. 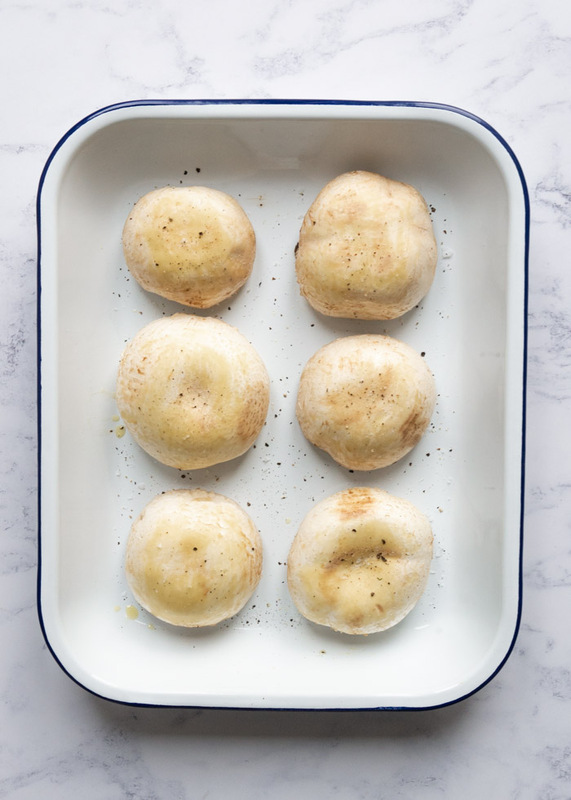 Pop the stuffed mushrooms in a roasting tin, cover with tin foil and put them in the oven for 10 minutes. Then remove the foil and cook for a further 5 minutes to ensure those breadcrumbs have a little bit of crunch. You could also microwave these mushrooms but the breadcrumbs on top will become a little bit soggy. You will, however, have the same great taste. 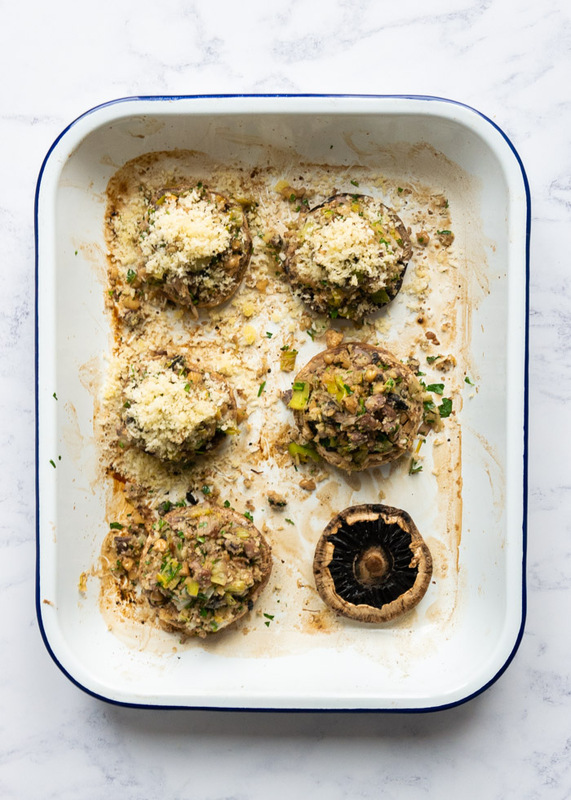 Pop the stuffed mushrooms in a microwave safe container, cover and heat for 3-5 minutes until fully warmed through. Can stuffed mushrooms be eaten cold? They can, although the texture will be affected slightly. They are best served hot. 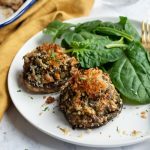 Can these stuffed mushrooms be adapted to be vegan? Yes! Either omit the Parmesan entirely or replace it with vegan Parmesan or a little bit of nutritional yeast. 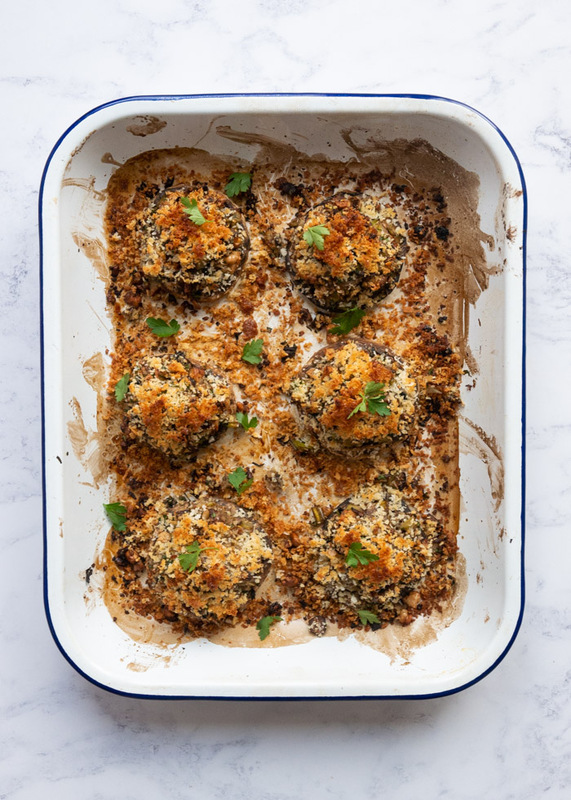 Can these stuffed mushrooms be adapted to be gluten-free? They definitely can! Simply replace the breadcrumbs with gluten-free breadcrumbs to make this meal gluten-free. 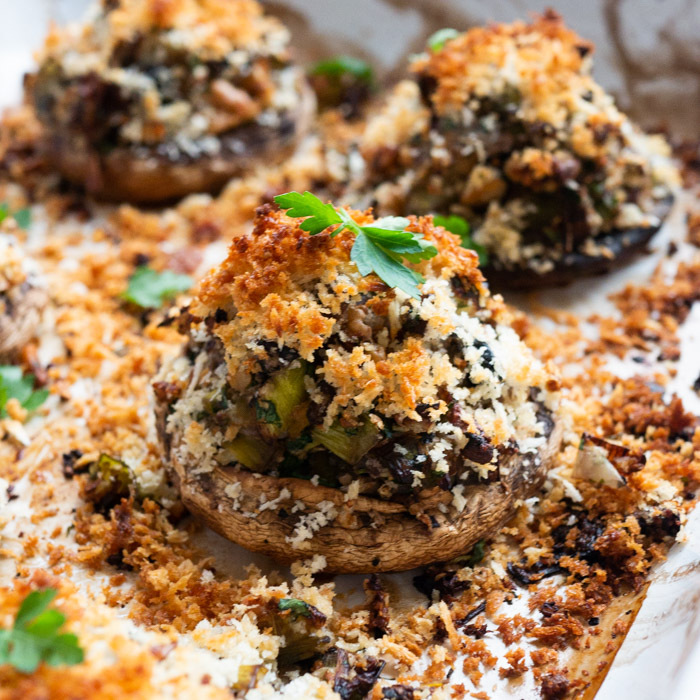 These stuffed mushroom caps are a great vegetarian weeknight dinner. 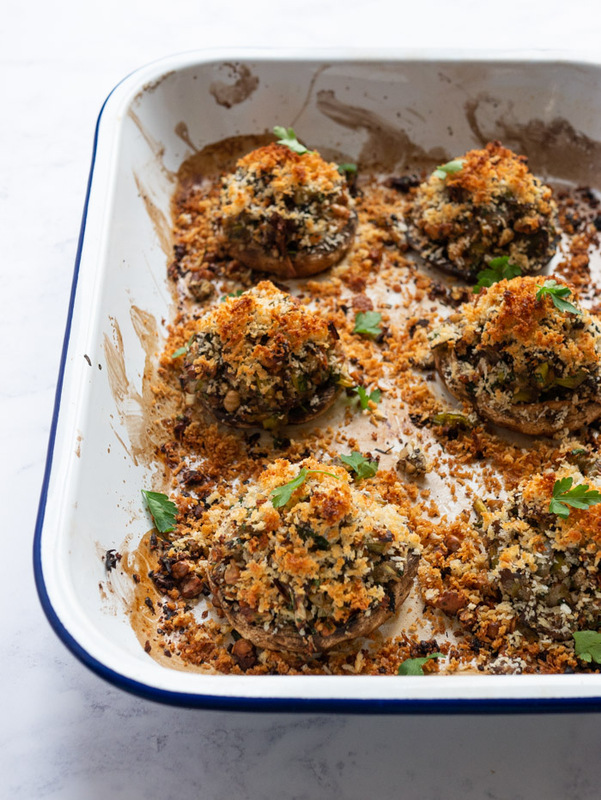 Filled with leeks, walnuts, mushroom, parsley, breadcrumbs and parmesan they’re full of flavour and easy to make. Pre-heat your oven to 180 degrees Celcius. Remove the stems from 6 of the mushrooms (save them for later) and add them, gills side down, to a roasting dish. Brush the tops with 1 tablespoon of the olive oil and sprinkle on some salt and pepper. Pop into the oven for 20 minutes. Heat another tablespoon of oil in a cast iron frying pan. Chop the mushroom stems and the remaining mushroom into chunks. Add it to your frying pan along with the leeks and cook for 5-7 minutes until the leeks have softened. Add in the walnuts and cook for another 5 minutes. 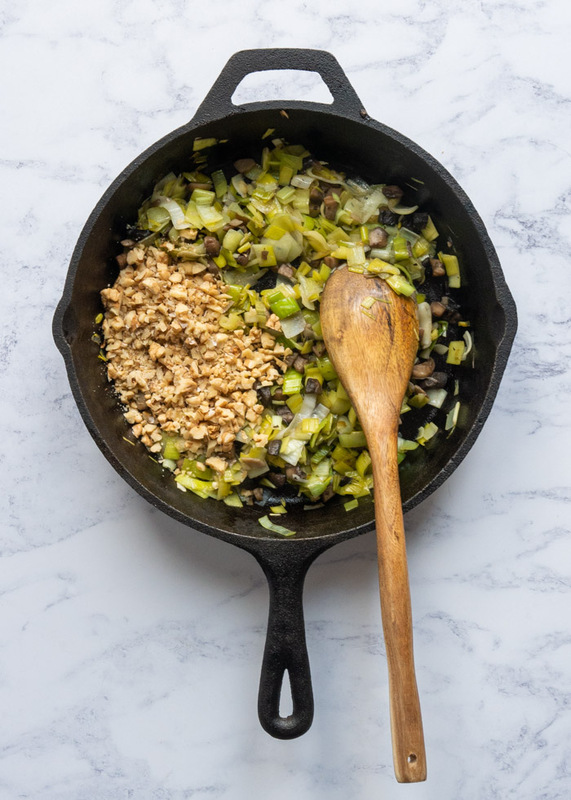 While the leeks and mushrooms cook, mix the panko, parmesan and 1 tablespoon of oil together in a bowl, ensuring the oil is evenly distributed throughout. After 5 minutes remove the leek mixture from the heat. 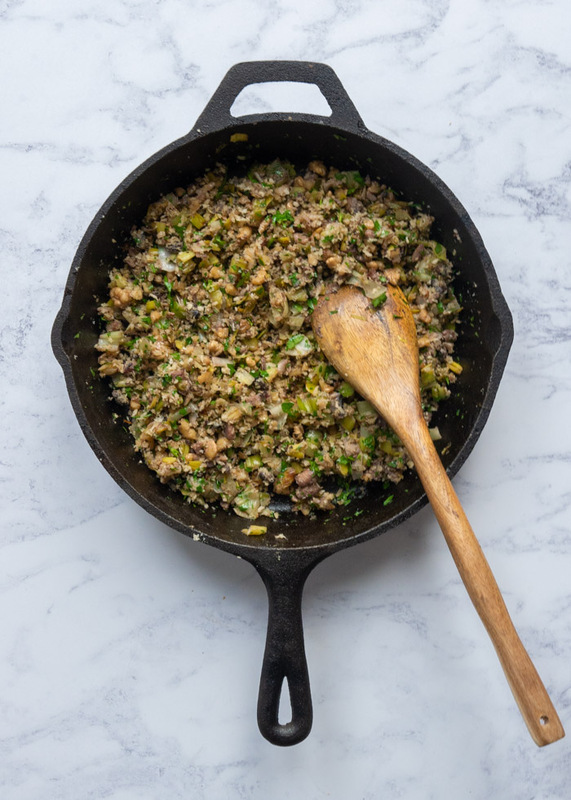 Stir in the mustard powder, parsley, lemon juice and two-thirds of the breadcrumb and parmesan into the leeks, taste and season with salt and pepper as required. Keep the remaining breadcrumbs aside for sprinkling on top later. When the mushrooms are done remove them from the oven and flip them over so the gills are facing upwards. Divide the leek stuffing equally between the 6 mushrooms then sprinkle over the remaining breadcrumbs over the mushrooms. Bake in the oven for 15 minutes, until the breadcrumbs are golden brown. Enjoy! I am a mushroom lover, too! Especially when they’re stuffed with all kinds of deliciousness like these ones are. I’d love to make a meal out of these! Thanks, Sues! I have them as a meal most of the time, but they work just as well as appetisers too! This would make a great game day appetizer! ooohhh!!! These look amazing! Love the step by step photos of this recipe too, you make it look super easy! I’m really trying to have at least one vegetarian meal per week and this looks perfect. 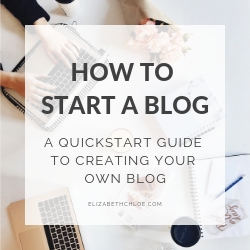 I love all of your lovely step by step photos to help me make them! Thanks, Karen, I hope you enjoy them! We made this last week for dinner, and it was incredible! Thanks so much for sharing! Thank you, Jessica, I’m so glad you enjoyed them!